August is a good month to look out for returning passage migrants. Waders such as Curlew Sandpiper, Whimbrel and Spotted Redshank are now moving south and many will pause on their journey to feed at places like Oare KWT reserve and Rainham RSPB reserve. So on Wednesday we went to Rainham hoping to see some of these passage birds. We did see Little Ringed Plover , Whimbrel, Green Sandpiper, Common Sandpiper and Wood Sandpiper (although it was only after some arguing that we finally agreed on what we had seen). Some Black-Tailed Godwits and Dunlin dropped in as we watched – both species still having the remnants of their breeding plumage. All of this, combined with the change in the weather made it feel a bit like autumn. But the bird of the day, for me at least, was the Little Grebe. They were still fully occupied with the business of rearing young. We must have seen about seven broods as we walked around the reserve. 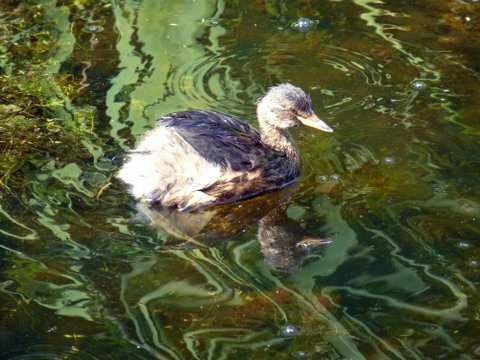 The bird that Sally photographed was most likely a young bird from an earlier brood and it was absolutely fearless. We were able to sit on a bench and watch it catching fish no more that 2m away! Didn’t need a telescope and it was too close for our binoculars – my kind of birdwatching. 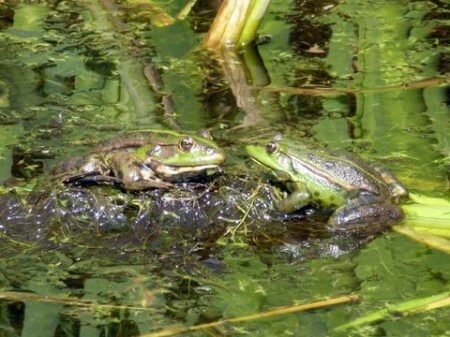 Also sitting on a bench were these two Marsh Frogs – apparently with absolutely nothing to do.